Some friends got me into this little contest that was held by the guys that made League of Legends. 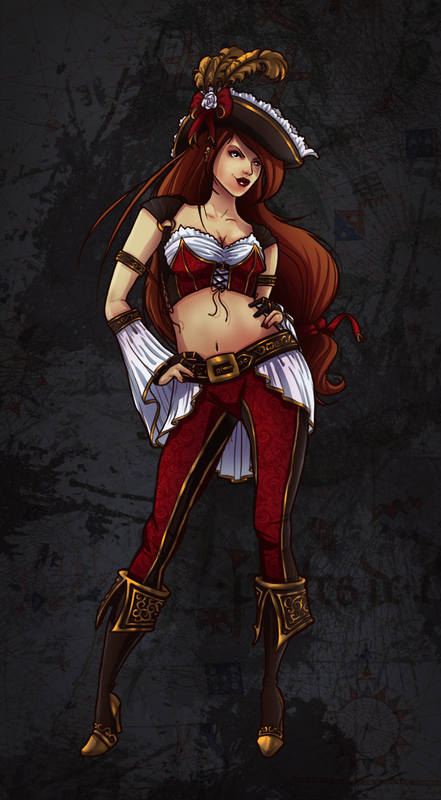 The contest was to make an entry that was pirate themed in celebration for their new character “Miss Fortune.” Originally, a friend of mine wanted to do a collab proj; I would make the concept and he would model it in 3D, then I would be the one to texture it. Well, unfortunately his computer kicked the bucket and I decided just to paint on top of my original concept and enter it anyway. Because I am a master at procrastination I didn’t start painting it till this afternoon, even though the deadline was at midnight tonight. So, with that said the paint job was a little rushed but I still like how it looks. Might need some polishing up later or something.